Thinking outside the bolt - Stop staring and start sewing! Sorry for the post-less week. We're tearing up my sewing room and turning it into Fabritopia (insert chorus of angels here) and trying to design our website and have it ready for the March grand opening. All this while tending to a sick baby who's flu had decided to jump hosts (from him to me). On the bright side, it's not finger flu so I can still type (There ya go honey. Way to find that silver lining). I'm so thrilled to have placed an order with Oliver + s company for some of their way darling patterns. It will be fun to try them out. I'm also placing an order with Montessori by Hand for some of their patterns (the apron is gorgeous!). And I've got goo-gobs of fabric on the way (I'm taking requests too!). In the meantime, here's something fun and cheap to encourage you to try something fun (and cheap!). I bought some velour blankets at IKEA for around 5.00 each on clearance. Don't you love the owls? I used the cute and easy Olivia pattern from Farbenmix to make this snuggly hoodie dress. I think I used an old New Look (old New? My foggy brain just got stuck there. Just move along.) pants pattern for the tights. I just narrowed them a little. 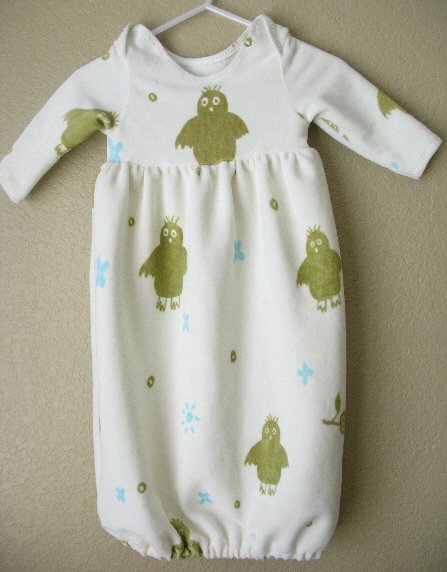 The dress took a little more than two blankets worth of fabric because of the layout (I didn't want some of the owls to be upside down) but I used the scraps from the second blanket to make the baby sack below. I used Simplicity 4153 for this little baby sack. It's the same pattern I used in this post and I love it because of the neck opening. I have a big headed baby and sometimes I really have to squeeze to get regular t-shirts on him. So sweet. So there are a couple non-fabric store sewing ideas. Think outside the bolt (teehee). Hey, I like that! I'm going to change my page title. Fun!